Indians, Pakistanis and Bangladeshis differ in a wide range of coronary risk factors and disease rates and combining their data is misleading. 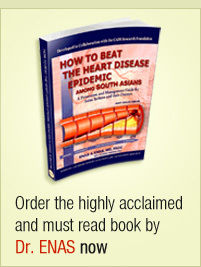 South Asians are disadvantaged in comparison with Europids.1, 2 Among South Asians, Indians were least and Bangladeshis most disadvantaged in a range of coronary risk factors in the UK.1, 2 The differences in standardized mortality rates among Indians and other South Asians are given in Figure 028. 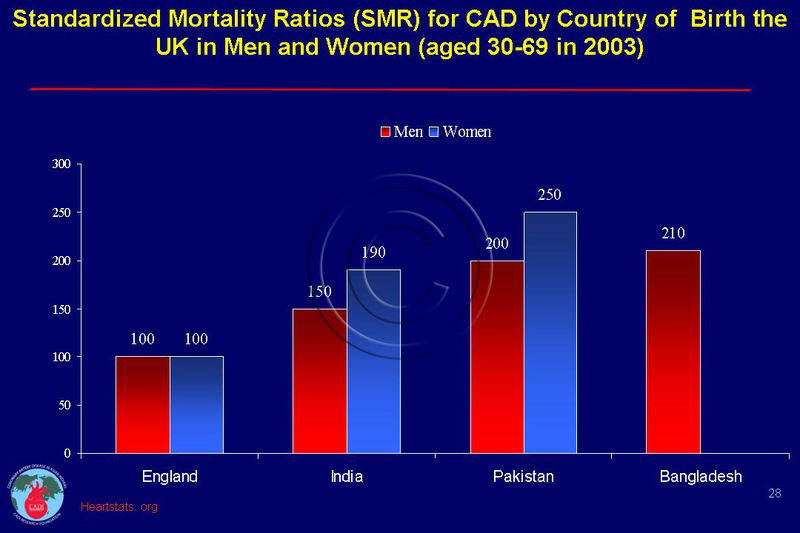 Currently, the mortality rates among Indians is 45% higher among men and 90% higher among women compared to their Europid counterparts.5 This trend may be applicable to first and second generation born in the UK. 1. Bhopal R, Unwin N, White M, et al. Heterogeneity of coronary heart disease risk factors in Indian, Pakistani, Bangladeshi, and European origin populations: cross sectional study. BMJ. 1999;319(7204):215-220. 2. Bhopal RS. Heterogeneity among Indians, Pakistanis, and Bangladeshis is key to racial inequities. Bmj. 2002;325(7369):903. 3. Hemingway H, Crook AM, Feder G, et al. Underuse of coronary revascularization procedures in patients considered appropriate candidates for revascularization. N Engl J Med. 2001;344(9):645-654. 4. Harding S, Rosato M, Teyhan A. Trends for coronary heart disease and stroke mortality among migrants in England and Wales, 1979-2003: slow declines notable for some groups. Heart (British Cardiac Society). Apr 2008;94(4):463-470. 5. www.heartstats.org. CHD Statistics. mortality. 2010. Accessed January 25,2011.